Dr. Kal Pasupathy is an Associate Professor in Mayo College of Medicine’s Health Sciences Research Department. He is an expert in information and decision sciences, with a specific focus on nonparametric modeling methods. He has conducted funded research, published over 65 peer-reviewed publications and a book on Health Informatics, mentored postdoctoral, graduate and undergraduate students. 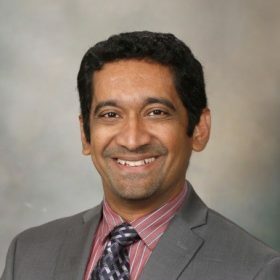 With over 18 years of academic and program leadership experience, he is the founding Scientific Director of Mayo Clinic’s Clinical Engineering Learning Laboratories, a transdisciplinary environment to advance science of care delivery and create the care of tomorrow. He directs the Information and Decision Engineering program with the Kern Center for the Science of Health Care Delivery. Notably, his program’s methodological inventions and practice impact have won multiple awards and impacted social services and health care. The research has been translated and used by American and British Red Cross, and in healthcare by nursing, pharmacy, surgery, emergency medicine and radiology. He is frequently sought to lecture, speak at international events and to consult for private and government health systems globally for practice transformation.